Montevertine is one of the most privileged spots for wine anywhere in the world. If I had to choose only one Sangiovese to cellar, it might very well be Montevertine's Le Pergole Torte. The wines from Montevertine, a small hillside property just outside Radda, in the heart of Chianti Classico, have demonstrated an uncanny ability to age beautifully for decades, acquiring incredible finesse in bottle. This cool, high altitude site encourages slow ripening and yields Sangioveses endowed with remarkable grace. Although most of the attention centers around the flagship Pergole Torte, I also adore the Montevertine bottling. Given the exceptional track record the Manetti family has built over the last few decades, it is hardly surprising some of their lesser known wines age just as well. Montevertine’s 1996 Pian del Ciampolo is frankly a revelation. At seventeen years of age, it is in great shape, which in and of itself is a remarkable achievement for an entry-level wine. The enticing Pinot-inflected bouquet laced with crushed flowers, earthiness and sweet dried cherries is utterly captivating. Although a little less interesting on the palate, the 1996 is beautifully balanced and flat-out delicious. What an eye-opening bottle. 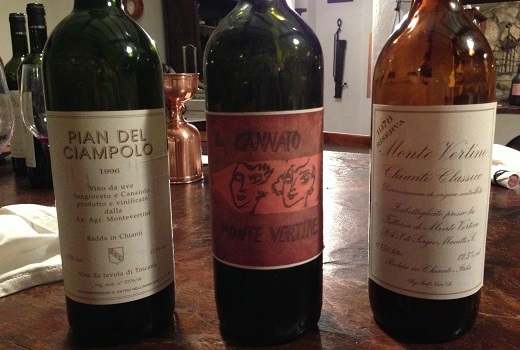 I will not be surprised if few readers have ever heard of Il Cannaio di Montevertine, a wine the estate made for Giorgio Pinchiorri and his famous restaurant in Florence beginning in the early 1980s. The 1986, a Sangiovese/Canaiolo blend from a single parcel on the property, is simply stunning. This is classic Montevertine. Deep, rich, yet miraculously weightless, the 1986 is firing on all cylinders. I doubt I will ever taste it again, but it seems pretty safe to say the 1986 will dazzle those lucky enough to find it for another 15-20 years. Wow.